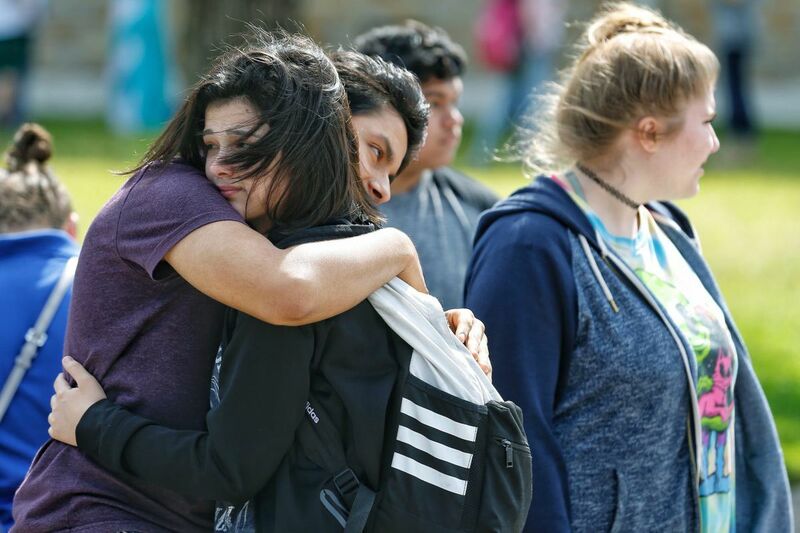 Following the May shooting at Santa Fe High School in Texas, freshman Caitlyn Girouard (center) hugged a friend as students and parents waited to reunited. The past year has seen 93 gun-related incidents in K-12 schools across the United States, the highest number since recording began in 1970 and more than double the number of shootings in 2017. The previous record was 59 incidents, set in 2006, according to data from the Center for Homeland Defense and Security Naval Postgraduate School. The data counts any time a gun “is brandished, is fired, or a bullet hits school property for any reason.” It includes shootings where there was no victim. A running tally kept by Education Week counted 113 people killed or injured in school shootings in 2018, with 23 shootings leading to injuries or deaths. The latest in the report was a Nov. 20 incident in Virginia in which one parent was wounded after a gun in another parent’s pocket accidentally discharged. In February, 17 were killed by a shooter at Marjory Stoneman Douglas High School in Parkland, Fla., and in May, 10 were killed at Santa Fe (Texas) High School. The Parkland shooting was highly publicized, and surviving students spoke, toured, and marched to put the issue in the national spotlight. As scrutiny on mass shootings and school violence increased, 2018 also saw myriad proposals for protecting students being made in state legislatures and individual school districts, ranging from arming teachers to stocking classrooms with objects to throw at a shooter and legalizing carrying firearms on school campuses. Several states passed laws expanding the ability to carry guns to types of venues that have been targeted in shootings, including schools and places of worship. Also this week, a draft report was released in Florida that detailed some confusion during the Parkland shooting, saying that the county sheriff’s office was not adequately trained and that some officers did not respond properly to the reports of gunshots. And last week, new details about the shooter who killed 26 at Sandy Hook Elementary School in Newtown, Conn., in 2012 emerged after the Hartford Courant obtained records detailing the man’s life and mental state. Friday will mark the sixth anniversary of that shooting, considered by many an early turning point in the modern gun-control movement. Since 1970, the three most-populous states have seen the highest number of gun-related incidents in schools -- California, 157; Texas, 131; and Florida, 87 -- according to the data. Pennsylvania has had 51 recorded incidents, and New Jersey, 9. In total, there have been 1,300 school shooting incidents since 1970, according to the center. In the vast majority, the shooter was a male high school student acting alone. In most, the perpetrator targeted specific victims. The top reasons for shootings were disputes, gang-related, or accidental. Just over 9 percent were suicides or attempted suicides, and 2 percent murder-suicides. Only four shootings were in self-defense.